Academy Training | South County Sports Club, Inc. The goals of South County Premier Soccer Club training program are to improve to the overall quality of play and enjoyment of the game, and maximize the training opportunities available for all of our players at an affordable cost. We recognize that players may sign up for soccer for a variety of reasons, but one thing is true for all – playing better soccer is more fun! The goal of the Academy Training Program is to provide each player with a solid base of fundamentals and technical skills that will enhance their performance and enjoyment of the game for years to come. The game os soccer really is the best teacher, and for players looking to maximize their potential, there is simply no substitute for playing it as much as possible. In the soccer powerhouses around the world like Brazil, Spain, Argentina, France, Germany, Holland – countries that consistently produce hundreds of world class players every year – children grow up playing the game with their friends every day just for fun. The majority of that time is spent in the unstructured environment of “street soccer” or “pick-up soccer”. Free from the competitive pressures and organization imposed by adults, children learn to play the game on their own terms – in the process developing the skill and creativity that has for too long been beyond the reach of most U.S. players. For those young players with a true passion for the game, we also offer additional training to prepare them for possible future participation in more competitive Travel (“Select”) Soccer. The sessions will consist of advanced footskills, passing and receiving work, possession games, and some basic tactical instruction during small-sided scrimmages. The footskills/technical portion of the program will be run by an experienced professional trainer, with the assistance of selected South County Premier Soccer Club coaches who are themselves preparing for possible coaching positions with travel teams in the future. The Academy Training Program will consist of advanced traning and skills-development sessions. Participation in this program will be strongly considered by coaches selecting players, as well as those forming Travel Teams. On the other hand, the program is not right for everyone. The training will be challenging and fast paced. It is designed for the most advanced soccer players who are internally motivated to improve. 5 & 6 year olds. 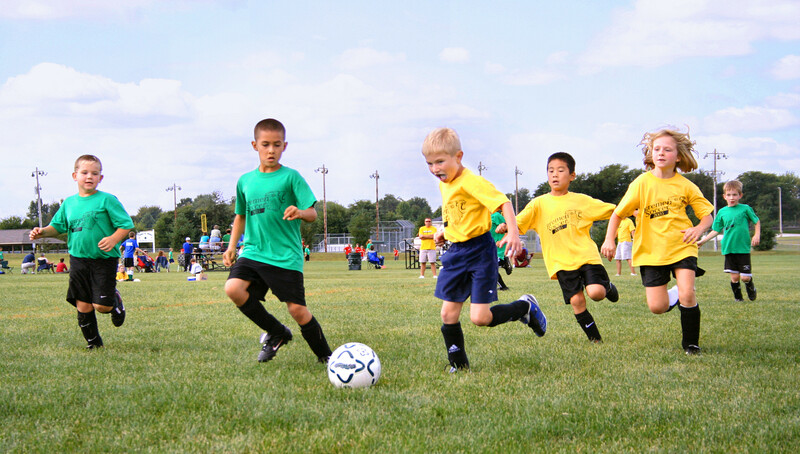 This class develops kicking, balance, dribbling, foot-eye coordination and running control by playing fun games. Some skill development games are played. Some 4 on 4 scrimmaging is mixed. 6 & 7 year olds (adv). Advanced skills are developed using fun games. Skill building and fitness prepares them for the next level of sports. 6 to 10 year olds. This class mixes skill development with actual small-sided games. It is geared to give kids lots of "touches" on the ball. Emphasis is on developing enjoyment of physical activity and the game of soccer. No score is kept. 10 to 12 year olds. Advanced skills are developed using fun games. Skill building and fitness prepares them for the next level of sports. Emphasis is on developing enjoyment of physical activity and the game of soccer. 12 to 14 year olds. The US Soccer Federation advocates that in order for a child to become a skillful player, they should have 1 million soccer ball touches before they are 16. The curriculum is professionally designed to develop motor skills, promote physical fitness, and create self confidence in kids and younger children. It stresses a non-competitive environment and promotes fun above all else. Private Individual Lessons Continue throughout the Winter months. Contact Our office at (703) 436-4408 or email to schedule your private workouts, including individual and small private group lessons. We will work with your family schedule! For more information contact us at for updates or if you have any questions.